Sabino "Cabi" Villalba Hernandez is the oldest of Andres Villalba and Bacilia Hernandez de Villalba's children. Sabino learned the traditional art from his father. Sabino and his wife, Veronica Silveira de Villalba, are another premier pottery-making team in Mata Ortiz: she polishes and sands while he paints and fires. 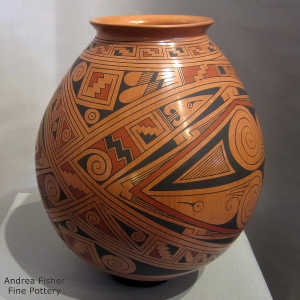 Sabino's designs usually incorporate Mimbres figures like bats, turtles, birds and lizards on a field of Paquimé geometric designs.